I don’t know about you, but I can’t bring myself to trudge from shop to shop in the January sales. I don’t know how people have the energy, the willpower or the money to do it. In all senses of the word, I am SPENT. So no, this isn’t a post listing all the current bargains. If that’s what you’re after, I’d suggest you visit some of the links I posted here, just before Christmas: these were the retailers with all the biggest and best bargains, slashing their prices even before Christmas Day was upon us. Without naming names I have noticed that in certain cases, the “January sale” is suspiciously identical to the store’s “run-up-to-Christmas sale”: similar products with similar discounts. Yawn. As in years gone by, I am holding my nerve and waiting until the end of the month, which is when most stores start slash-slash-slashing at their sale prices, and the final reductions are made. Come play the long game with me! This year I may be on the lookout for a new hoover: my trusty old VAX 121 vacuum is about 30 years old and, although I have been replacing parts as needed, I’ve been having some problems with it of late. I also have an obsession with this green trench coat from Hobbs, which has already been reduced by £80 but remains ridiculously expensive; I need to find a way to get it for a sliver of the sale price, short of ram-raiding the Harrogate branch. All suggestions welcomed. Aw, come on – don’t look at me like that. I know you are all Christmassed out. We all are. But Christmas 2014 starts here: at shops and supermarkets up and down the country, Christmas products and gifts have now been slashed to crazy-low prices. My advice? If you have the money to spare, stock up now. Pack the Christmas goodies away.Then unpack them again in December, when you can count yourself quids in, marvel at your money-saving nous. So far I have picked up a pack of Asda crackers reduced to 25p (above) and a gorgeous Gruffalo’s Child advent calendar from a posh department store in Harrogate, for half-price. I’m also in the market for cards and gifts. Keep your eye out, and there are bargains agogo. The best of them seem to be available in-store rather than online, and in some cases the reductions vary between stores and areas. I recommend that you keep an eye on this page of Hot UK Deals for the latest discounts; HDUK readers seem to be particularly good at spotting and sharing them. Asda: girl’s Christmas tree outfit reduced from £8 to 50p. Sainsburys: luxury crackers reduced from £15 to £1.50. Sainsburys: Christmas wrapping paper reduced to 20p. Sainsburys: Hello Kitty bubble bath reduced from £7 to 70p. Sainsburys: Christmas tree decorations reduced to 20p. Sainsburys: gift tags reduced to 10p. Card Factory: all Christmas merchandise half-price. Boxes of Christmas cards for 99p. Six rolls of wrapping paper for £1. 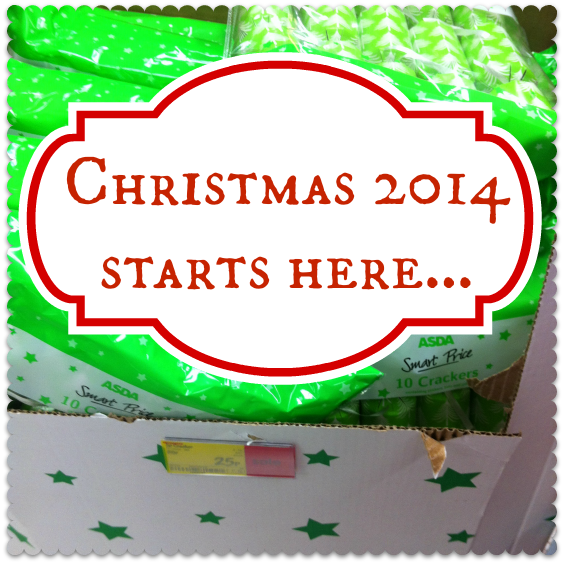 Asda: rolls of wrapping paper for 1p – 25p, depending on store. Argos: 48-pack of Christmas tree baubles reduced from £9.99 to £1.99. Argos: Jumbo red Christmas stocking reduced from £5.99 to £0.99. Argos: Chad Valley Christmas craft set reduced from £19.99 to £4.99. This is a kit for kids to make cards, decorations and so on. Asda: Christmas tree decorations scanning at 2p each at selected stores. Waitrose: rolls of wrapping paper for 12p – 15p each. Homebase: 6ft Rocky Mountain Christmas tree reduced from £139.99 to £10. If you have the space to store this stuff, go for it. And trust me: Christmas 2014 may seem a long way away now, but once it rolls around again you’ll be congratulating yourself on having done half the Christmas prep work already. Buying things in January last year really helped with our Christmas budget! I’m going to have a scour around Sainsbury’s tomorrow night for some of these goodies. Don’t worry Miss Thirty, I’m gettin the same looks or moments silence when I tell F&Fs that I’m planning for Xmas 2014 already. And I’m planning to make it a Homemade one at that. *I’ve been collecting those Dome & Hexagon shaped honey/jam jars since last yr. These will be for my homemade fudge. *Stock piled on gift wrap ribbon reels (amongst other craft goodies) in the Wilkinson sale. These will be for my jars of fudge and card making in general. *PoundStretcher is another great place to get Christmas stock reductions. It also helps if the packaging is damaged, as you can always get a few more pence to a £1 knocked off. *And as for stamps, (lordy lord they ain’t cheap) I find it best to buy a 6 or 12 2nd class pk each month. And stash them in the Xmas 2014 box. That way you’ll be able to send the cards you do want to send to F&Fs without having to worry about the cost come Dec.
Each year i wait for Christmas to come so that i can buy some goodies at discounted price and enjoy them but when Christmas passes , i gets bored . enjoyed your ideas, many thanks, have started to make Christmas cards from ones received 2013. I don’t know why, but I always seem to forget about hukd!! I guess it makes sense to shop for presents in sales and throughout the year rather than during the run up to Christmas. Doing it this way would also benefit people who are strict with their finances too. I’d be more than happy to take a small chunk out of my monthly spend if it means I’m not spending the earth later on in the year for potentially the same present.